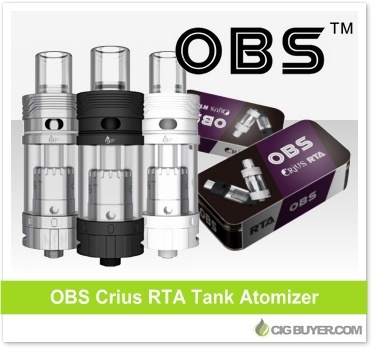 Designed specifically for rebuilding, the OBS Crius RTA Tank is an excellent rebuildable tank atomizer with many innovations. It has a unique side fill design, dual coil build deck and it’s the first RTA to offer juice flow control. To adjust for higher viscosity juices just turn the tank section to the desired flow setting. Constructed of 304 stainless steel and glass, it has 4.2ml of capacity, adjustable airflow and was designed for super easy cleaning.